Max Murphy can finally rest easy. In Italy, halfway across the world from the Maya Death Lords, Max can hang out with friends and eat his mom's new invention, Pizza Gelato. Nothing to worry about, right? That is until his gondola ride ends up in a fight with an octopus who tries to drag Max into the Underworld. The Death Lords have no intention of letting Max off that easily. Max reunites with Lola, the mysterious Maya girl, in Central America. Together, along with the howler monkeys Lord-6 Dog and Lady Coco, they embark down the Monkey River while trying to outrun a hurricane. The river leads them to what is supposed to be a luxury hotel. The hotel turns out to be a frightening underground hotel of the Death Lords. Here they are given a series of tests which concludes with an ancient Maya ballgame Lola and Max must play to survive. But, what happens when it's a game you can't win? Lola and Max are about to find out. Authors, Jon and Pamela Voelkel, continue the Jaguer Stones Series with an action packed sequel in The River of No Return which will not disappoint fans of the previous books. Especially intriguing are the secrets held by Max and Lola and the artful way those secrets are slowly revealed. The authors weave together the Maya culture and history in way that will spark the interest of young readers without boring them. The allure of the jungles of Central awaits in an Indiana Jones type adventure. 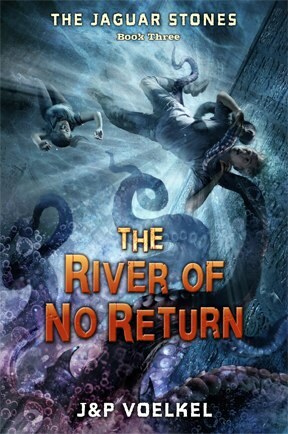 Recommended as a solid, middle grade series for the action adventure lover. **Per FTC regulations: I received a Advanced Reader's copy of the book from the publisher to facilitate the review as a member of online media. No other compensation was received and I reserve the right to give my honest opinions about the book. I do not accept books for review if I am asked to give a positive review in exchange for the book. Advanced Reader's copies have no monetary value.